Online Registration Form: Register NOW! An informal reception will be held on Monday, March 24. A general plenary session, in which the highlights of each symposium will be presented, will be held on Tuesday, March 25. Symposia will be limited to 40–60 participants each. Participation will be open to active participants as well as other interested individuals on a first-come, first-served basis. Each participant will be expected to attend a single symposium. AAAI technical reports will be distributed to participants in electronic format and posted in the AAAI Digital Library. To register, please complete the online registration form. For questions or further information, please contact AAAI at sss14@aaai.org. Symposium concludes at 12:30 pm. Registration will be held at Stanford University on the lower level of the Cummings Art Building in the foyer of Annenberg Auditorium. ALL ATTENDEES MUST PREREGISTER. All accepted authors, invited speakers, symposium participants, and other invited attendees must register by February 7, 2014. Participation will be open to active participants as well as interested individuals on a first-come, first-served basis. All registrations should be completed by February 28, 2014. The conference registration fee includes admission to one symposium, one copy of the electronic proceedings, coffee breaks, and the opening reception. Payment of registration fees is required at the time of registration. Checks and bank transfers must be in US dollars. Checks (drawn on US bank) or international money orders should be made out to AAAI. American Express, MasterCard, VISA, Discover, and Diners Club are also accepted. Registration applications must be submitted online via the URL below. If you qualify for student rates, please submit your proof of student status to AAAI by email attachment to sss14@aaai.org or by fax to +1-650-321-4457. The registration form is available online at https://www.regonline.com/sss14. The deadline for refund requests is March 7, 2014. No refunds will be granted after this date. All refund requests must be made in writing to sss14@aaai.org. A $75.00 processing fee will be levied on all refunds granted. Are you an author of a paper? When you arrive at Stanford, please pick up your badge at the Spring Symposium Series registration desk, which will be located on the lower level of the Cummings Art Building in the foyer of Annenberg Auditorium. Please call AAAI at 650-328-3123 or email sss14@aaai.org for further information. For your convenience, AAAI has reserved a small block of rooms at the hotels listed below. Symposium attendees must contact the hotels directly. Please identify yourself as an AAAI Spring Symposium Series attendee to qualify for the reduced rates. Attendees are encouraged to reserve early because of limited hotel rooms due to other events in the Palo Alto area at the same time. www.creekside-inn.com Please make reservations by calling the hotel directly and referring to the group "SSS-14." There are a number of additional hotel and motel options in the immediate Stanford area. Please see the lodging page on the Stanford University website for a list of properties and contact information. In offering Stanford University, the Cardinal Hotel, and the Creekside Inn, (hereinafter referred to as "Suppliers") and all other service providers for the AAAI Spring Symposium Series, the Association for the Advancement of Artificial Intelligence acts only in the capacity of agent for the Suppliers, which are the providers of hotel rooms and transportation. Because the Association for the Advancement of Artificial Intelligence has no control over the personnel, equipment or operations of providers of accommodations or other services included as part of the Symposium program, AAAI assumes no responsibility for and will not be liable for any personal delay, inconveniences or other damage suffered by symposium participants which may arise by reason of (1) any wrongful or negligent acts or omissions on the part of any Supplier or its employees, (2) any defect in or failure of any vehicle, equipment or instrumentality owned, operated or otherwise used by any Supplier, or (3) any wrongful or negligent acts or omissions on the part of any other party not under the control, direct or otherwise, of AAAI. This information is the best available at time of publication. Fares and routes change frequently. Please check by telephoning the appropriate numbers below for the most up-to-date information. The Stanford University Marguerite Shuttle Bus provides service from several points along El Camino Real, the CalTrain station, and other surrounding locations to the Stanford Oval as well as transportation around the Stanford Campus. For route and schedule information, see the Marguerite page on the Stanford University website. CalTrain runs between San Francisco and San Jose, with stops in Palo Alto starting at 5:00 AM with the last train leaving San Francisco at 11:59 PM (weekdays). For up-to-date fare information and timetables, please visit the CalTrain website or call 1-800-500-4636. AAAI has arranged for symposium attendee parking in the Galvez Lot on the Stanford campus, March 24-26, at a discounted cost of $8.00 per day. All symposium attendees will receive a parking coupon code, which may be used to secure the discounted parking rate for their numbered space in the Galvez lot. Attendees will pay the fee directly at one of the nine (9) pay machines at the lot. The machines accept MasterCard, Visa, Discovery or exact cash only. A map of the Galvez lot location will be mailed to all registrants prior to the symposium. Registrants can also refer to the parking map available on the Stanford University website. Note that Stanford has very strict parking guidelines for visitors. The AAAI Spring Symposium parking coupon is valid in the Galvez lot only. Note: If you park in the SSS-14 designated parking lot, you will need to take the campus shuttle (Marguerite) to the Spring Symposium registration area and sessions. Please allow an extra thirty minutes travel time in your schedule for the shuttle. Individual papers presented at the symposium will be made available in the AAAI digital library. 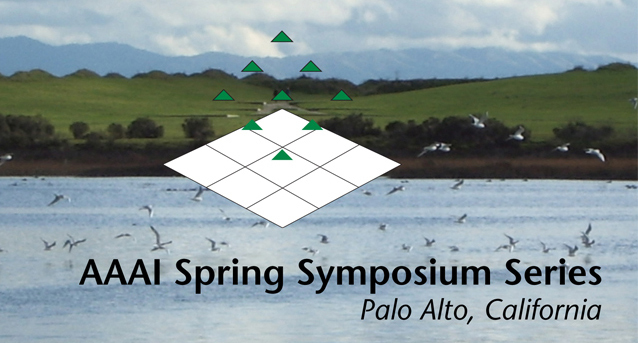 Some AAAI symposia are available as technical reports. For contents and ordering information, consult the Spring or Fall sections of the AAAI Press Technical Reports Catalog.